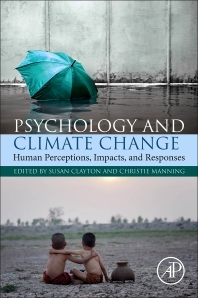 Psychology and Climate Change: Human Perceptions, Impacts, and Responses organizes and summarizes recent psychological research that relates to the issue of climate change. The book covers topics such as how people perceive and respond to climate change, how people understand and communicate about the issue, how it impacts individuals and communities, particularly vulnerable communities, and how individuals and communities can best prepare for and mitigate negative climate change impacts. It addresses the topic at multiple scales, from individuals to close social networks and communities. Further, it considers the role of social diversity in shaping vulnerability and reactions to climate change. Psychology and Climate Change describes the implications of psychological processes such as perceptions and motivations (e.g., risk perception, motivated cognition, denial), emotional responses, group identities, mental health and well-being, sense of place, and behavior (mitigation and adaptation). The book strives to engage diverse stakeholders, from multiple disciplines in addition to psychology, and at every level of decision making - individual, community, national, and international, to understand the ways in which human capabilities and tendencies can and should shape policy and action to address the urgent and very real issue of climate change. Susan Clayton is the Whitmore-Williams Professor of Psychology at the College of Wooster. She is the editor of The Oxford Handbook of Environmental and Conservation Psychology (2012) and the co-author of Conservation Psychology: Understanding and Promoting Human Care for Nature (20015), as well as co-authoring or co-editing three other books. She was a co-author of the 2010 APA Task Force on Psychology and Global Climate Change. She is the former president of the Society for Environmental, Population, and Conservation Psychology and of the Society for the Psychological Study of Social issues. She has given numerous psychology and climate change. Christie Manning is a faculty member of the Department of Environmental Studies at Macalester College. She is co-author of the textbook Psychology for Sustainability, Fourth Edition (Routledge 2016). Her interdisciplinary research explores the effectiveness of community-based initiatives to mitigate and adapt to climate change impacts. She has given many presentations on the role of psychology in facilitating climate adaption efforts.